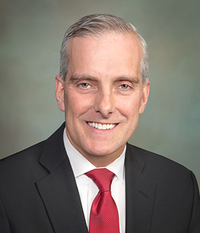 Andrew Card and Denis McDonough, chiefs of staff to Presidents George W. Bush and Barack Obama, will discuss U.S. foreign policy in a keynote Notre Dame Forum event at 7 p.m. Oct. 4 (Wednesday) in the Leighton Concert Hall of the University’s DeBartolo Performing Arts Center. The event is free and open to the public. Doors open and a pre-event reception commences at 6 p.m. in the venue lobby. 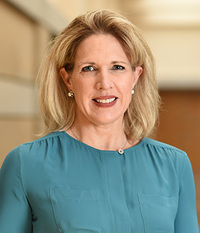 “Views from the West Wing: How Global Trends Shape U.S. Foreign Policy” will be moderated by Maura Policelli, executive director of the Global Policy Initiative in Notre Dame’s Keough School of Global Affairs. 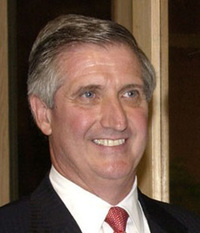 Card served as Bush’s chief of staff from November 2000 to April 2006 and was the person who informed the president of the terrorist attacks on Sept. 11 during a visit to an elementary school in Florida. He is the second-longest-serving White House chief of staff in history. A graduate of Saint John’s University in Collegeville, Minnesota, McDonough earned a master’s degree from Georgetown University’s Edmund A. Walsh School of Foreign Service.McDonough was appointed chief of staff in January 2013 and served throughout Obama’s second term. He previously held several positions in the National Security Council, including deputy national security adviser. He was in that role as part of a small group of officials who joined Obama in the White House Situation Room on May 1, 2011, monitoring the progress of the SEAL raid on bin Laden. Originally published by Dennis Brown at news.nd.edu on September 28, 2017.